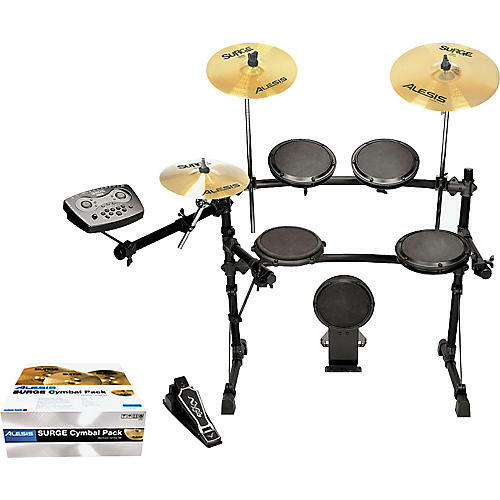 This package includes the Simmons SD7K Electronic Drum Set accompanied by the Alesis Surge Cymbals. This percussion setup is a great way to enter into the world of electronic drums with its realistic feel and sounds, recording capabilities, effects/volume controls, and complete creative freedom. The drum feel is incredibly lifelike, with over 300 realistic sounds and an expressive hi-hat. The bass drum pad accommodates a double pedal. With a dual-zone snare pad and 20 preset kits and space for 30 user kits, the Simmons SD7K delivers state-of-the-art electronic sounds with USB connectivity at an unbeatable price. The Simmons SD7K Drum Set has live, electronic drum pads and hand percussion options letting you add exotic sounds that would otherwise require a large and space-consuming collection of instruments. Drum giants like Vinnie Colaiuta and Josh Freese incorporate electronic drums into their live kits, giving them a far broader palette to work from. Plus, with many bands playing live to sequenced backgrounds, electronics are essential for triggering and interacting with your backing tracks. In the studio, the wide variety of sample libraries available make electronic drum sets more useful than ever. Just play the song, and use the SD7K kit's MIDI signal to trigger your choice of samples, and you'll have drum tracks that can be endlessly altered as you mix. Replace the snare, kick or toms, or combine multiple samples for a massively powerful wall of sound. Bass pedal sold separately. SURGE cymbals are the world's first cymbals with built-in electronic triggers. Made in Canada from genuine cymbal brass-alloy, SURGE cymbals have centuries of cymbal craftsmanship in their DNA, crossbred with Alesis' decades of experience in electronic triggering technology. Among the world's most realistic-looking, accurately responding, and most importantly natural-feeling cymbal triggers. Not cymbal pads in any way, SURGE cymbals are true brass cymbals at their core with exclusive clear sound dampening to cut the cymbals' acoustic sound. They employ industry-standard piezo triggers, so they are easy to use with any existing electronic drum set, replacing those uninspiring hard black cymbal pads. Because they are cymbals, they mount on any cymbal stand so they are easy to integrate into both electronic and acoustic drum setups using any sound module, drum "brain," or trigger-to-MIDI converter. This cymbal pack contains a 12" hi-hat, a 13" crash with choke capability, and a 16" dual-zone ride with choke capability. A large choke strip on the underside of the crash and ride cymbals sends a message to the sound module to choke the cymbal sound when activated”just like choking any other cymbal.